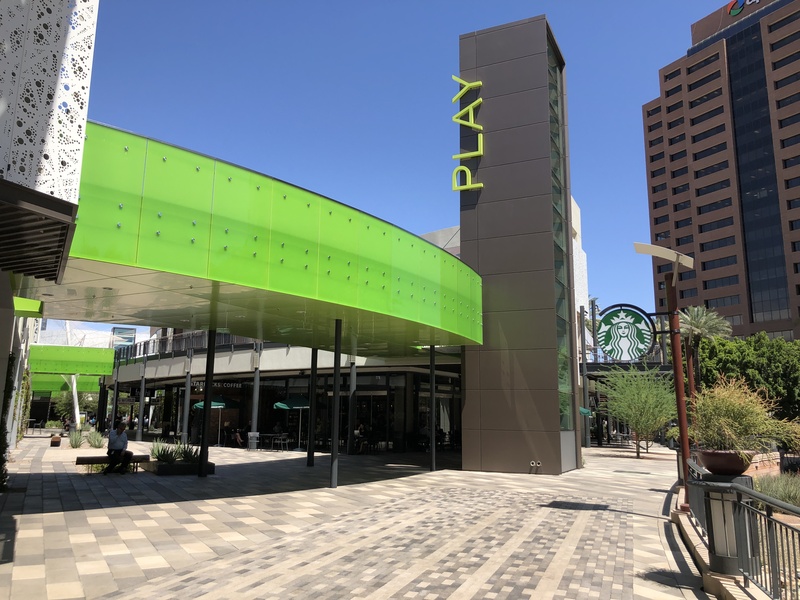 Arizona Center transforms into modern urban destination with new design, tenants after $25M renovation - Downtown Phoenix Inc. 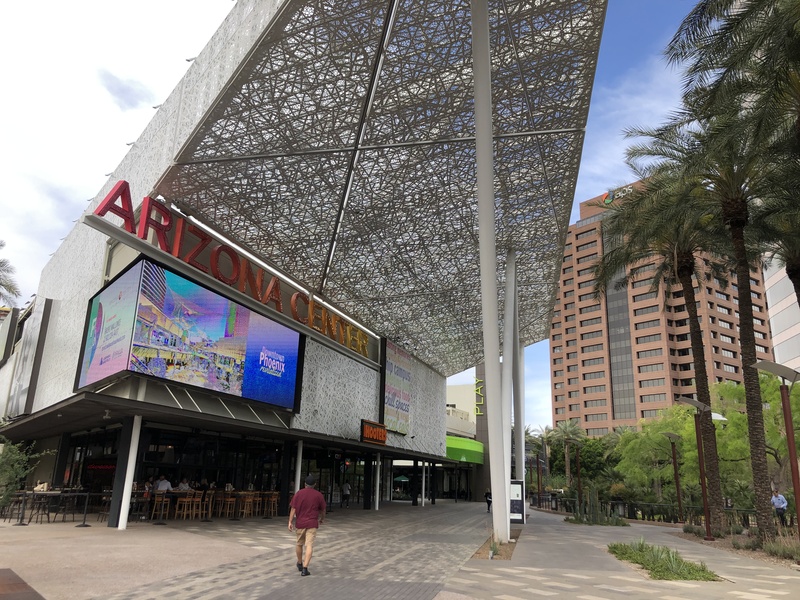 The Arizona Center recently completed construction on its $25 million makeover. 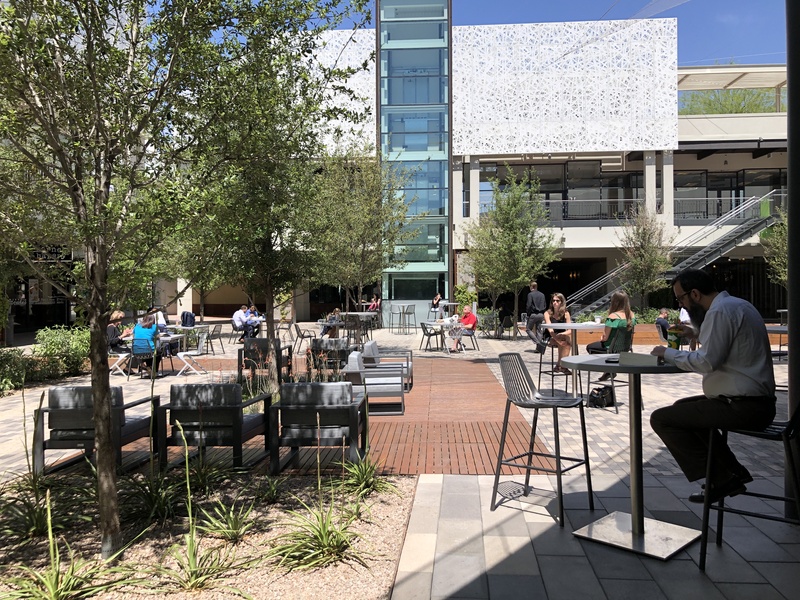 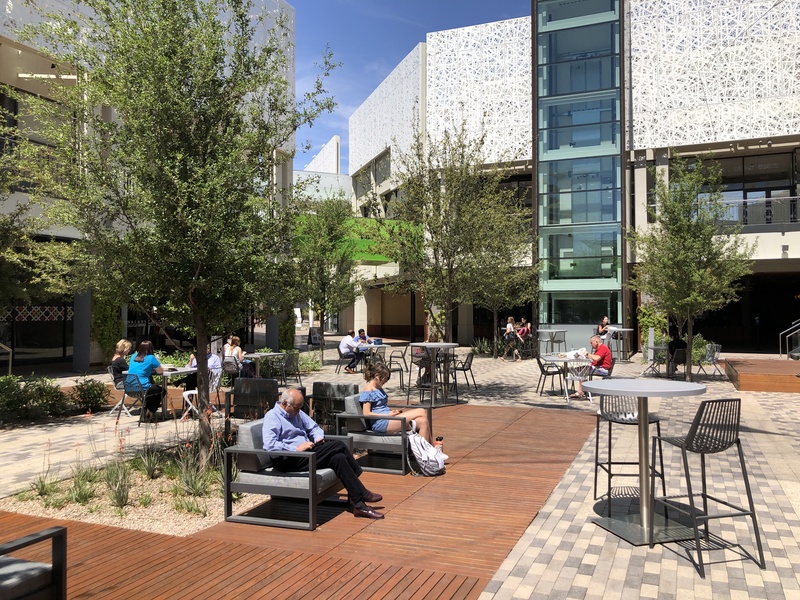 The renovation, which began in 2017, transforms the 30-year-old development into a more lively and modern destination, with new creative office space, outdoor work stations, shopping, entertainment and casual dining. 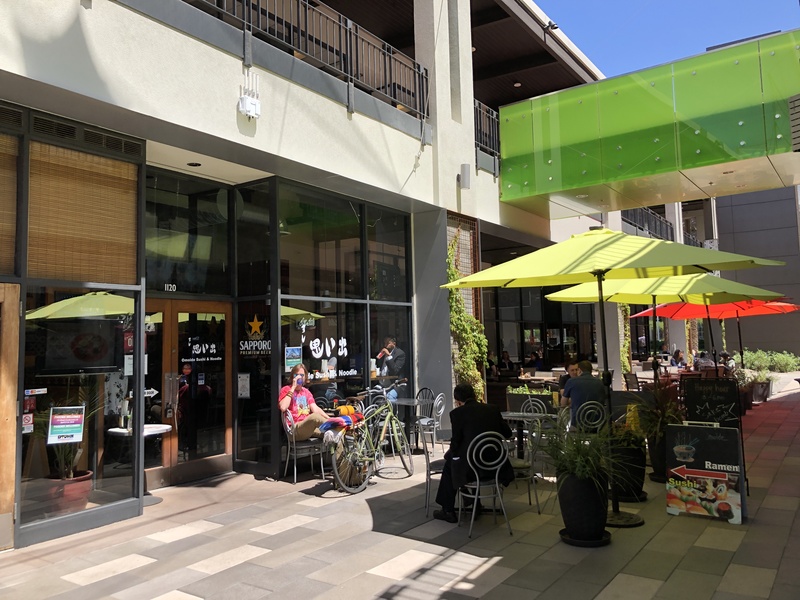 Added density is also planned for the site, with a boutique hotel breaking ground this month, and residential tower to come. 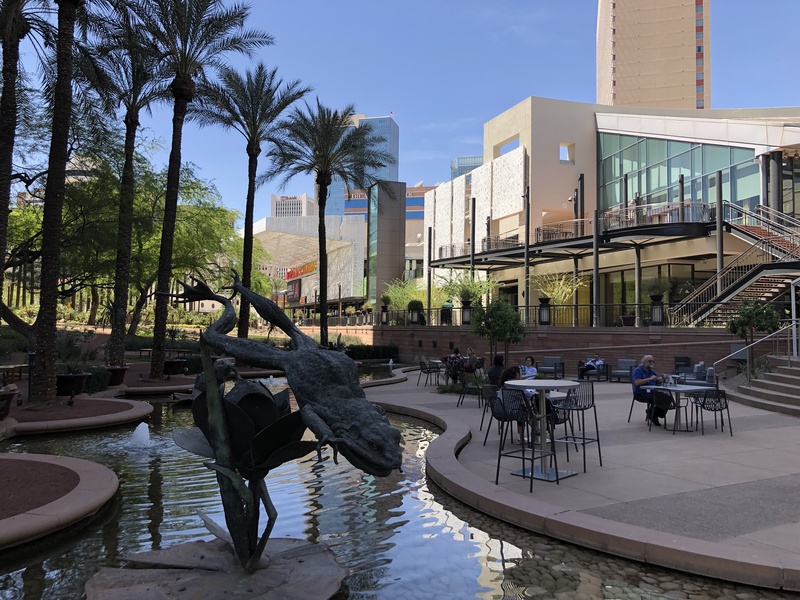 Originally built in 1990, it’s supported hoped the Arizona Center would help advance the revitalization of Downtown Phoenix. 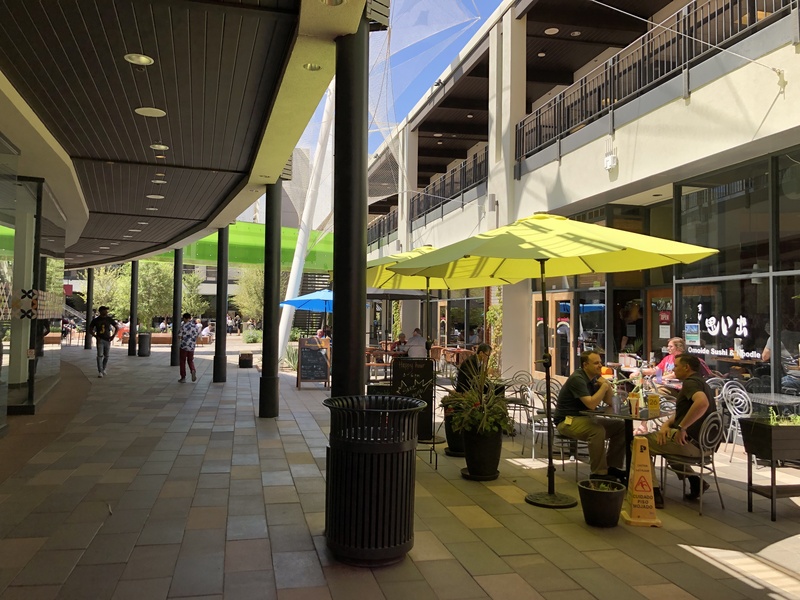 However, between opening at the cusp of the recession, and then enduring the Great Recession of 2007, the Arizona Center’s vision to be a catalyst for the area came up short. 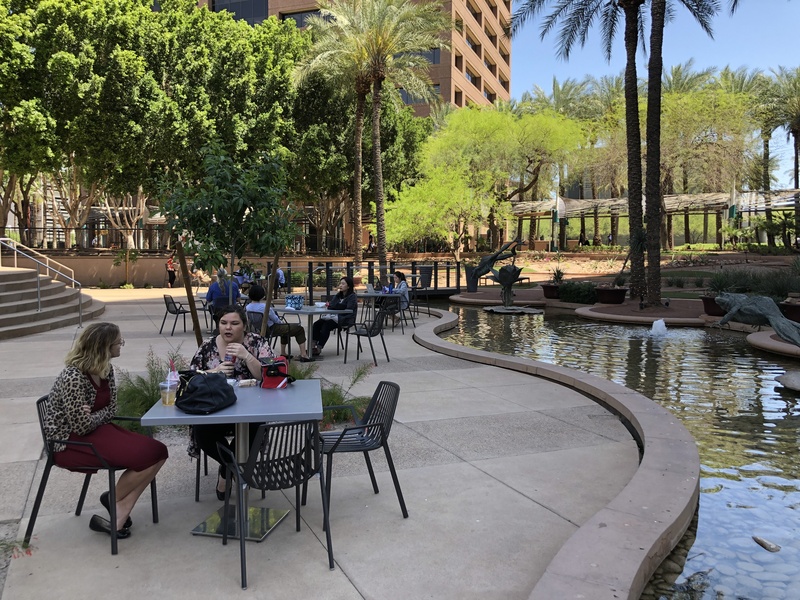 Fast forward to 2015, as revitalization efforts downtown were truly taking flight, Parallel Capital Partners purchased the 16-acre site and began setting the stage for the ambitious renovation process that would come two years later. 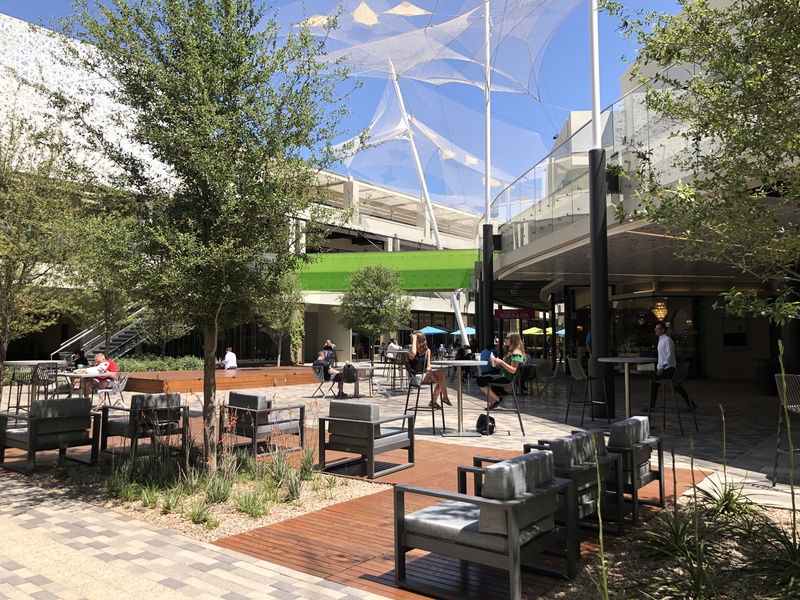 New site furnishings, comfortable and movable seating; shade structures, landscaping, lighting, new materials, fixtures and finishes and wayfinding are visible throughout the space. 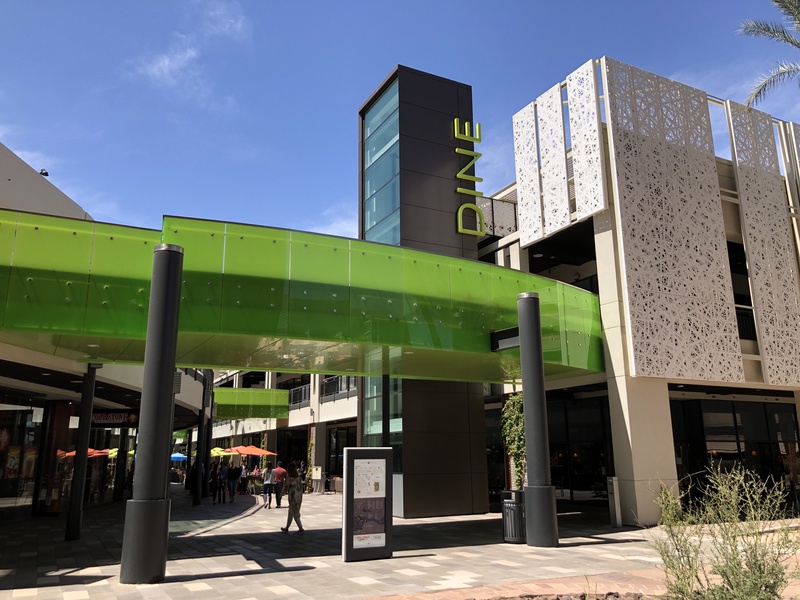 Modern pops of neon yellow/green panels accentuate the architecture and sculptural netting forms suspend from the second level, adding intrigue. 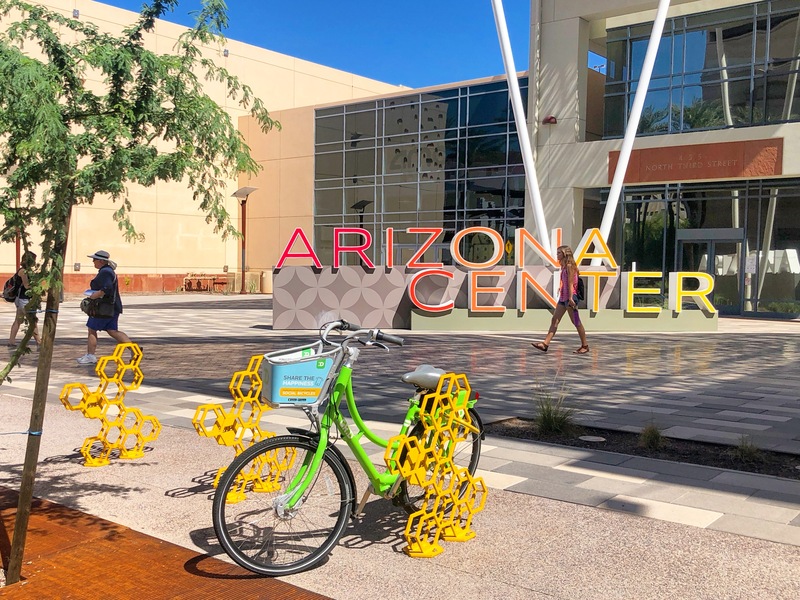 Colorful artist-designed bike racks from the Pedal to the Metal PHX Bike Rack Project are also featured on site. 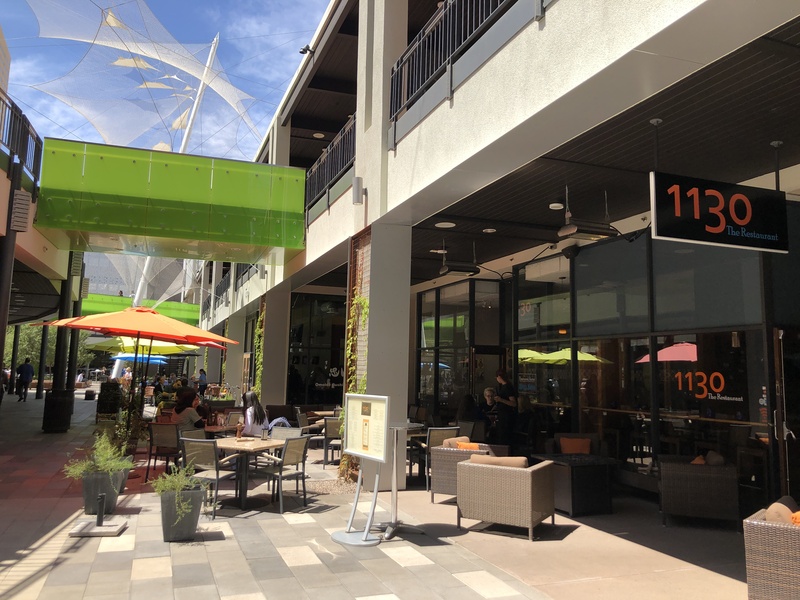 New retail tenants have also opened in the space, with more in the works. 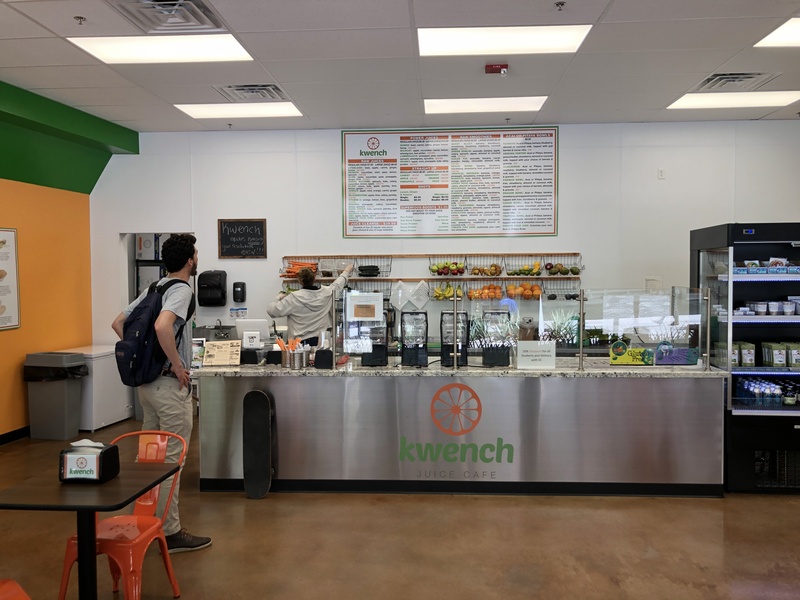 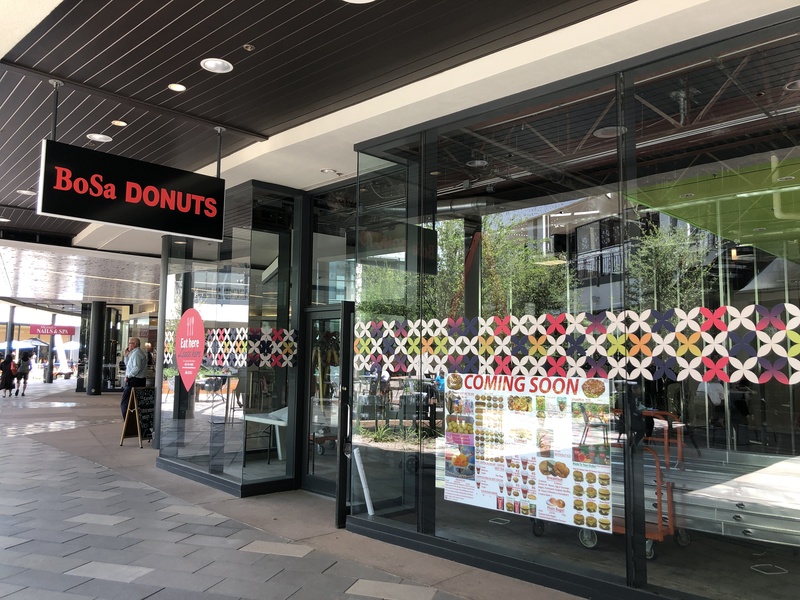 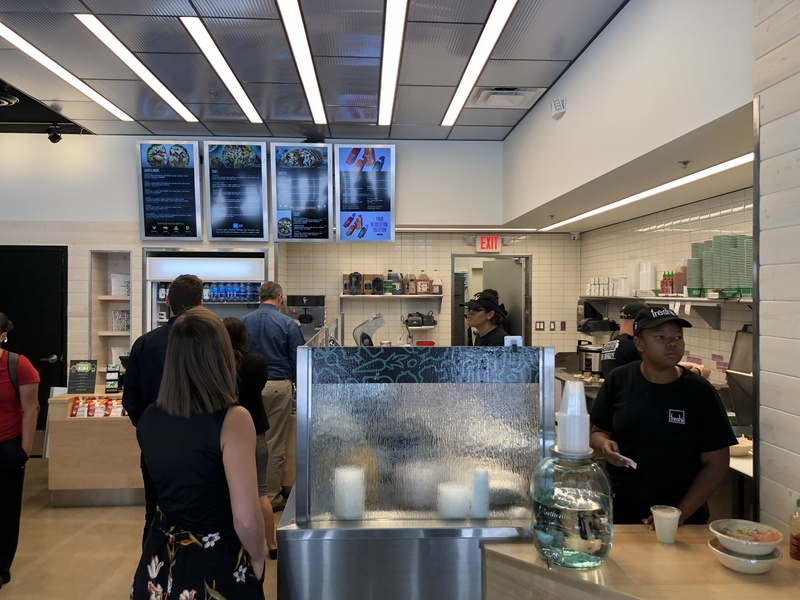 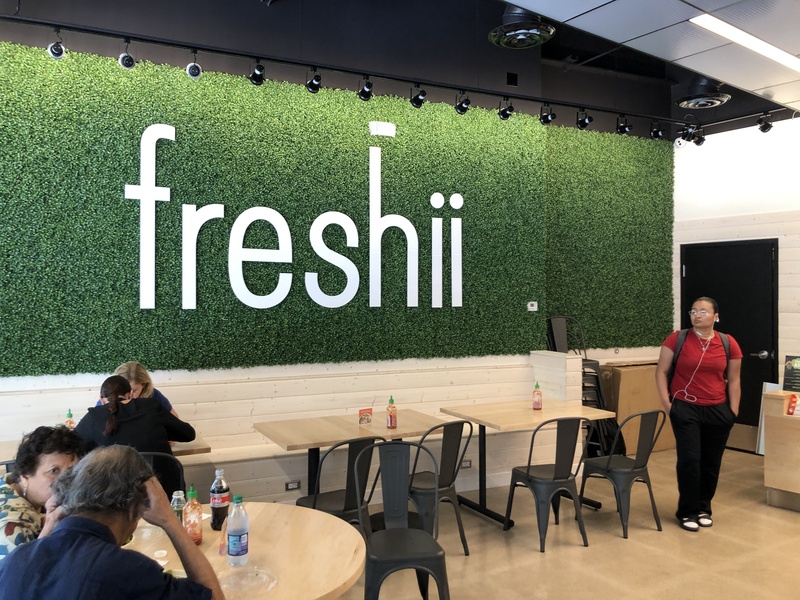 Kwench Juice Café and Freshii, fast casual fresh and nutritious food, are two of the new spots to grab a healthy drink or meal, and construction on a new Bosa Donuts location is currently underway. 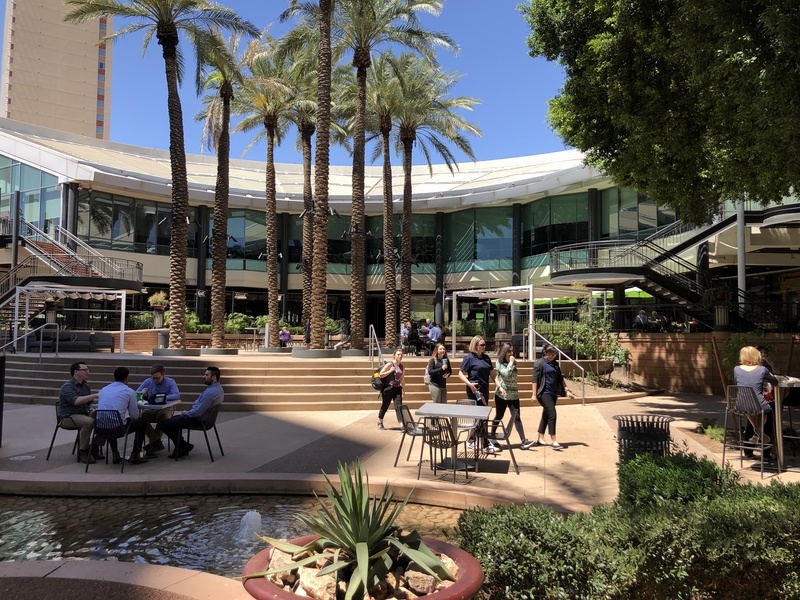 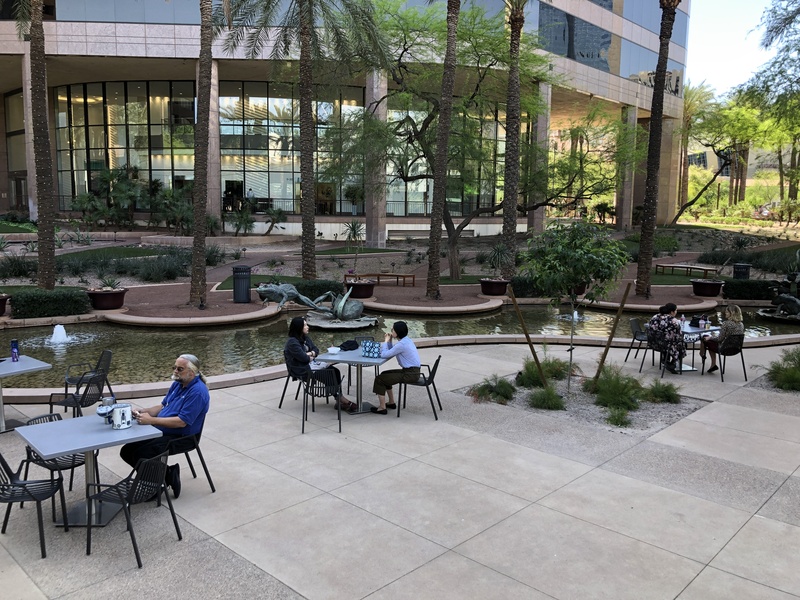 Additionally, Arizona Center has a variety of mixed-use office space which includes tenant, Arizona State University’s Thunderbird School of Global Management, which begins construction on its new building later this fall. 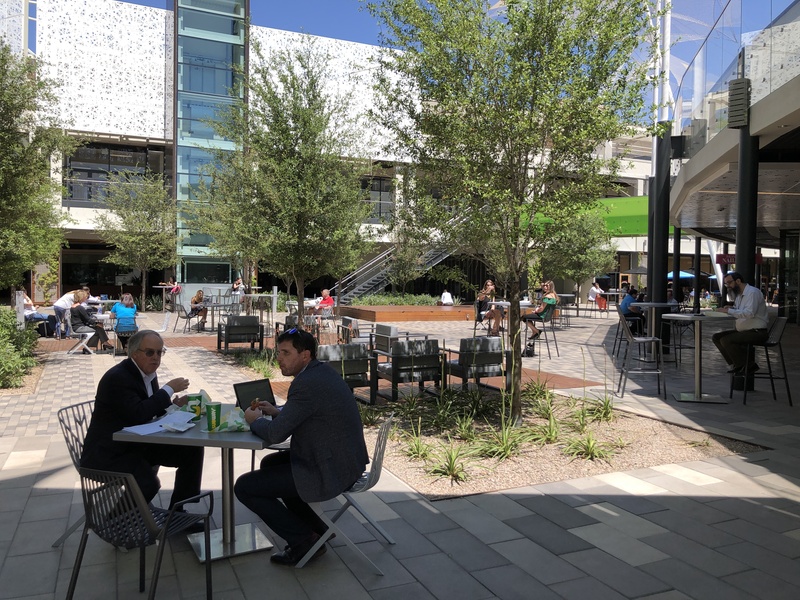 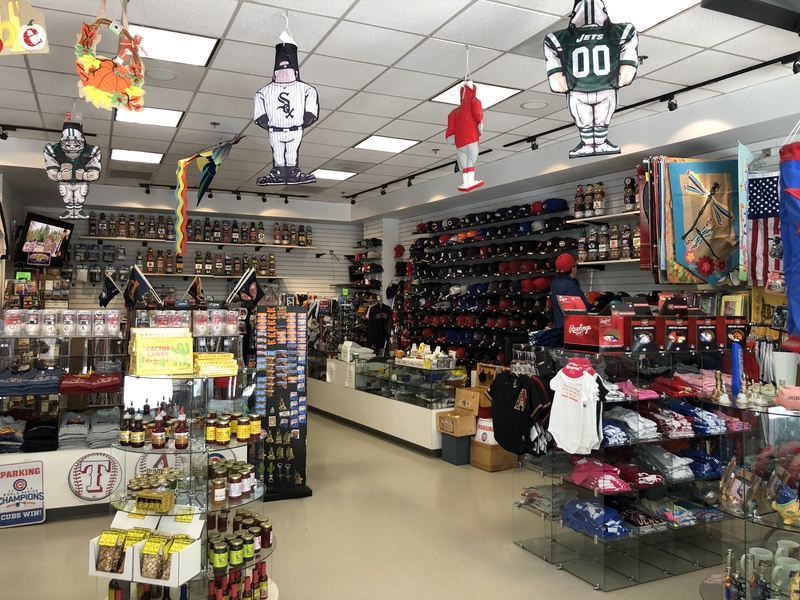 With the excitement of new retailers, visitors will also be able to visit popular, long-standing tenants of the space like Flag World, Canyon Cafe, Omoide Sushi & Noodle Bar, Mi Amigo’s, Moriah Nails, AMC Theater, 1130 the Restaurant and more. 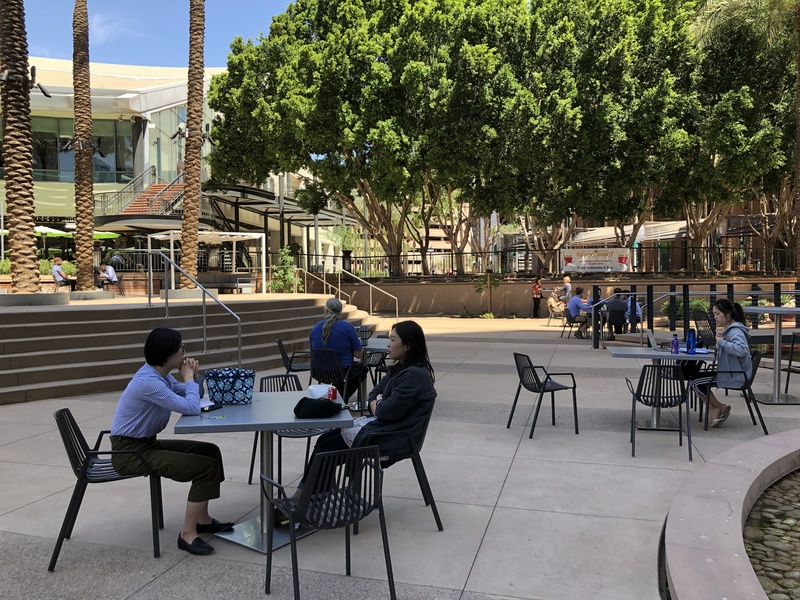 Arizona Center has also made efforts to program the new space with free community events like movie nights in the grotto, as well as a weekly farmers market on Wednesdays from 4-8 p.m. 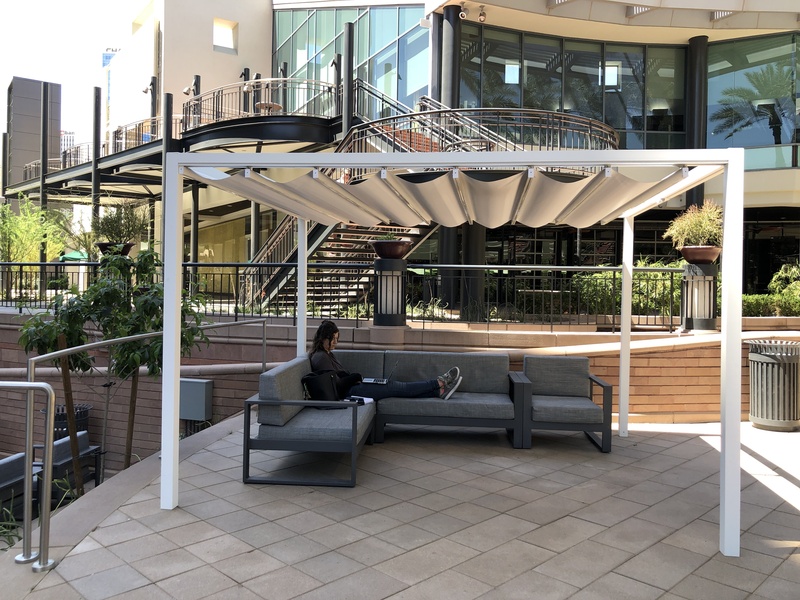 There is also a new stage in the central courtyard for live music. 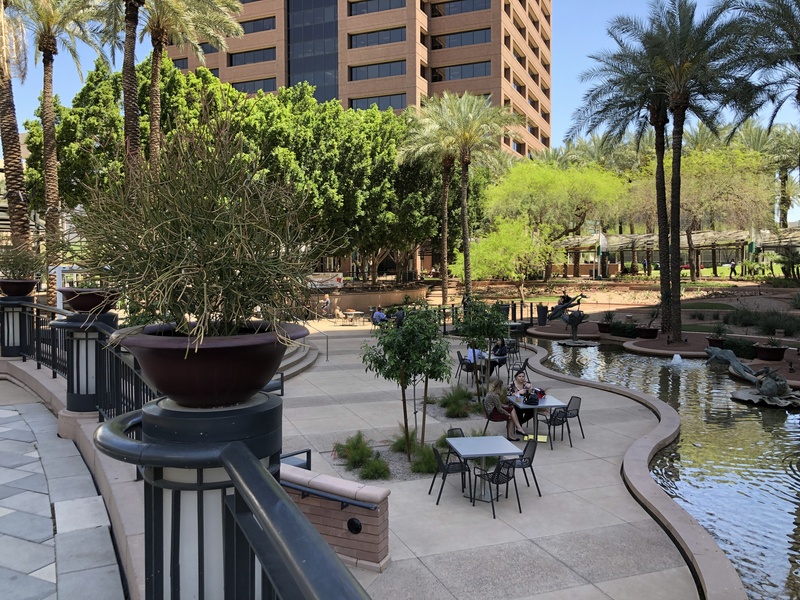 In addition to the renovations, the first upscale select-service boutique hotel in the Downtown Core, AC Hotel by Marriott, will break ground this month. 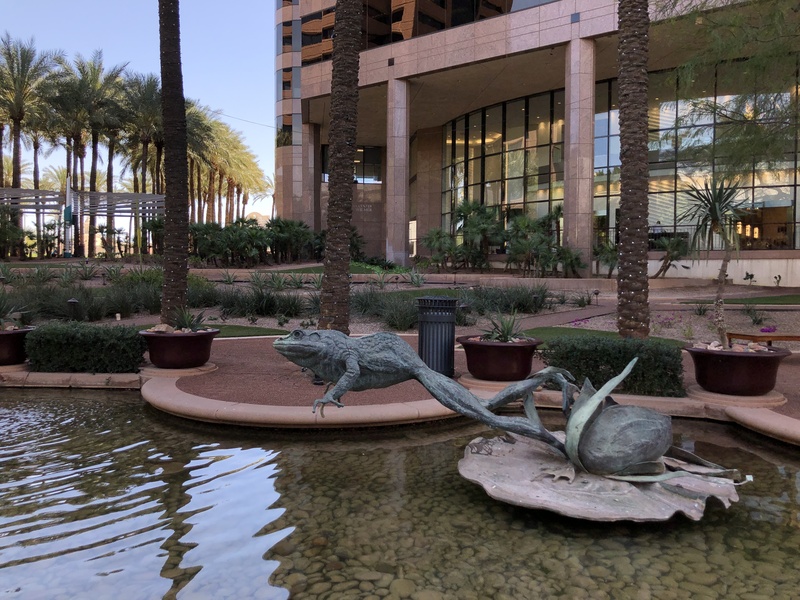 The 13-story, 199-room hotel is scheduled for completion in the third quarter of 2020. 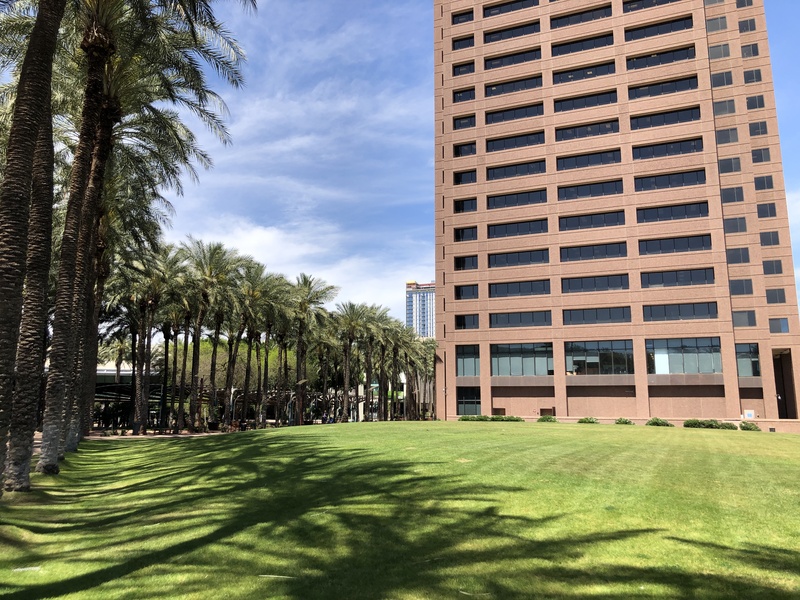 Construction on a new 31-story residential tower, Palm Tower, is also slated for the site. 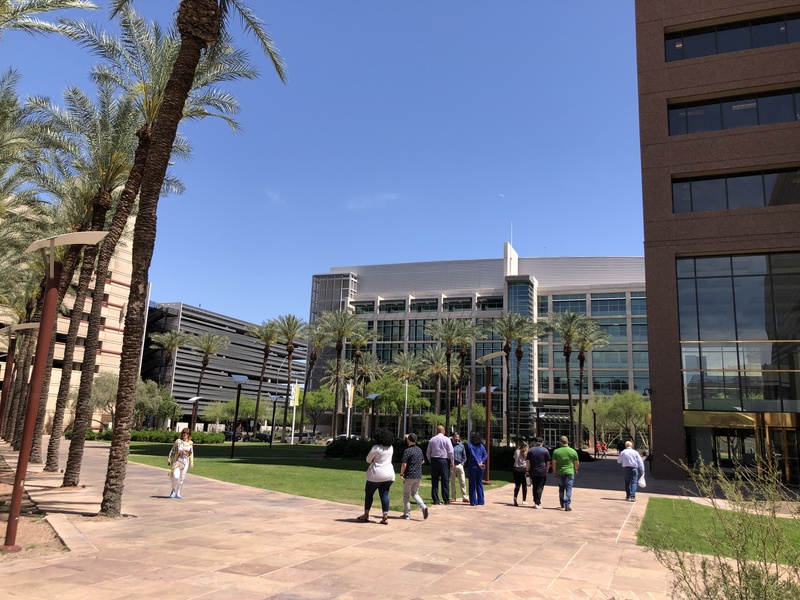 No exact dates have been announced for either ground breaking.